BELLEVILLE, Ont. 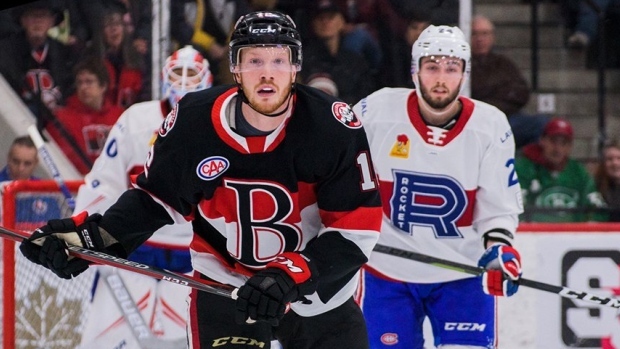 — The Belleville Senators reversed their fortunes against Laval on Saturday night, beating the Rocket 6-5 in a shootout in American Hockey League action. Visiting Laval beat Belleville in a shootout in the opener of a back-to-back set on Friday night. Logan Brown scored the only goal in Saturday's shootout for Belleville (32-25-3-5). Nick Paul, with two goals and two assists, Darren Archibald, Filip Chlapik and Jack Rodewald scored in regulation for the Senators. Top Ottawa NHL prospect Erik Brannstrom had three assists. Alex Belzile, with two, Jake Evans and Nikita Jevpalovs scored for the Rocket (26-27-6-5). Alexandre Grenier had four assists for Laval. Belleville hosts the Utica Comets on Wednesday night, while Laval is home to the Providence Bruins the same evening.